Indicator plants are not always suitable for the timing of pest management practices. You may not have the critical indicator plant nearby to time local activities, or there may not be a good indicator plant for a particular pest’s crucial life stage. Another way of achieving the same result is to use degree day calculations. Degree days (also known as heat units or thermal units) are a way of incorporating both temperature and time into one measurement to quantify the rate of plant or insect development. All plants and insects develop in response to temperature. The warmer the weather, the more quickly they develop, and the cooler the temperature, the slower they develop. All species have a cutoff temperature below which no development occurs. This base temperature, or developmental threshold, differs depending on the species. As the ambient temperature increases above the threshold, development occurs. The higher the temperature, the faster the rate of development. The most common developmental threshold is 50°F. This is the temperature at which dormancy is broken in plants and when many insects become active. But there are a number of insects, particularly those that are active early in the spring, that have a lower threshold (38° or 43°F), and many cool-season vegetables such as cole crops and peas have a base temperature of 40°F. 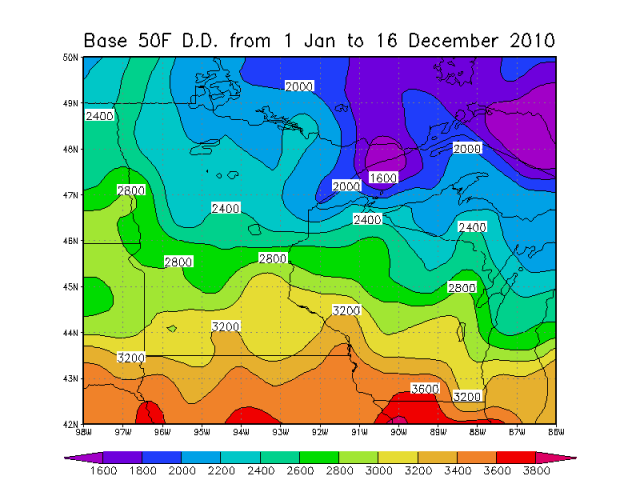 The base temperature is often noted as a subscript number following the abbreviation for degree day (e.g., DD50). Degree days are accumulated whenever the temperature exceeds the predetermined developmental threshold. A certain number of units are added each 24 hour period, depending on how much the temperature is above threshold, to produce a cumulative total of degree days. The mathematics for calculating actual degree days can be very complex (determining the area under the curve for the graph of time vs. temperature), but easy mathematical equations yield approximations satisfactory for practical applications. Daily DD50 = Ave. Daily Temp. – Base Temp. If the average degree day value for a given day is less than zero, just record zero, not a negative number. Finally, to keep track of degree day accumulation, keep a running total of all degree days accumulated from the first of the year. In Wisconsin, we often don’t accumulate many degree days before April 1, so if you wish to take a break from the math from January to April, go ahead. The equation above is a very rough estimate of degree day accumulation. There is also an upper threshold for development in insects, above which there is no appreciable increase in the rate of development. This is obviously of more concern later in the season than in the spring. To compensate for the reduced growth rate at high temperatures, modified degree days use an upper threshold of 86°F as well as the lower threshold. Whenever the actual temperature is below the base temperature, the base temperature is substituted as the low temperature for the day. Similarly, whenever the daily high is above 86°, 86 is used as the high temperature for the day. 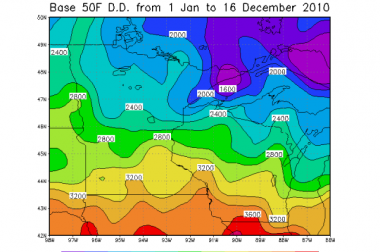 If you are not inclined to dig out your calculator and record daily temperatures, you can visit the University of Wisconsin’s Soil Science website at http://agwx.soils.wisc.edu/uwex_agwx/thermal_models/degree_days and use their computerized degree day calculator. All you need to know is your latitude and longitude coordinates.